Poet Suzanne Helfman: I had no idea what to expect; it was a complete mystery to me. Artist Gabe Travis: During a Vermont Studio Center residency last winter, I started a series of mixed media collage work with “Field Guide” as a springboard. So I was immediately drawn to the poem because of this connection. As I lived with the poem a while I realized many of the concepts it addresses—gender role expectations, knowledge and intuition, natural history—are compelling to me. Poet Suzanne Helfman: The poem evokes California poppies for me, but of course it’s not about poppies. The fact that the visual image contains flowers, some of them ambiguous, but no distinct California poppies, helps underscore the sense of uncertainty, the speaker’s negotiations with the listener about who sees what, and the fact that they don’t agree about what they see. I also love the blue paper doll figure who embodies the word demure in a way that seems so right but in a way I hadn’t imagined. Poet Suzanne Helfman: Everything. I know from teaching reading and writing, and from engaging in both myself, that a new text is created by every reader, that meaning is made collaboratively. The reader brings his or her life and world to the text, finds something on the page and interprets what’s there using whatever he or she brought to the reading. To see a visual representation of this, my poem creating new images in someone else’s head, and then in the world, is thrilling. 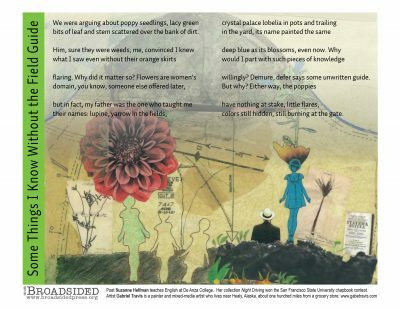 Artist Gabe Travis: The music of the poem sounded different to me when I read it oriented horizontally on the finished Broadside. I noticed different sound and syllable connections and a few of the imagistic parallels were highlighted, for instance the “blue blossoms” in the poem and in the artwork were in close proximity, so they stood out more to me. Poet Suzanne Helfman: My father was a visual artist. His paintings and photographs line my walls. Fictionalized versions of some of them have found their way into my work, in part because I love the images, but also because I want to enter the paintings, to understand them from the inside out. In creating fictional paintings and painters, I get to be a visual artist myself without lifting a brush. Artist Gabe Travis: When I am doing mixed media work I start with the materials. I have quite a stockpile of papers, magazines, sewing patterns, etc. So I glean from my supplies the images and colors and textures that echo the concepts and feeling that the poem evoked for me. It is a pretty intuitive process of holding the poem in mind, and browsing until something catches my eye. Then, once the “palette” is assembled, I begin to build the piece. If you had to represent the Broadsided of “Some Things I Know Without the Field Guide” with one word, what would it be? Poet Suzanne Helfman: Lorrie Moore, A Gate at The Stairs; Richard Russo, Bridge of Sighs; Elizabeth Strout Olive Kitteridge. Artist Gabe Travis: I have just started a short story collection, Both Ways Is the Only Way I Want It by Maile Meloy, and just finished the novel The Yiddish Policeman’s Union by Michael Chabon. Poet Suzanne Helfman: I saw two exhibits at SF MOMA in the last few months that moved and inspired me: William Kentridge: “Five Themes” and “Looking In: Robert Frank’s ‘The Americans'”. Wow. Poet Suzanne Helfman: I’m grateful for the chance to collaborate. Writing can be very lonely. To see a visual interpretation of my poem, evidence that my images spoke to someone else loudly enough to inspire new images, is very gratifying. Artist Gabe Travis: I was struck by the richness of reading one poem over and over, across a period of a couple of months, soaking in it in a deliberate but leisurely way, like a poetry infusion. Also, the collaboration really was three-way, in the sense that the Broadsided editor(s) arrange the poem and artwork together which made both seem new—more than a sum of their parts. Poet Suzanne Helfman teaches English at De Anza College in Cupertino, California. Her work has appeared in Ironwood, Poetry Flash, Five Fingers Review, Magazine. Her collection Night Driving was published as the winning manuscript in a San Francisco State University chapbook contest. Artist Gabe Travis is a painter and mixed-media artist who lives near Healy, Alaska, about one hundred miles from a grocery store. www.gabetravis.com.